Seems like a lot of rice for the money! Works out at £0.60/kg while even the tesco value stuff is £1.13/kg. 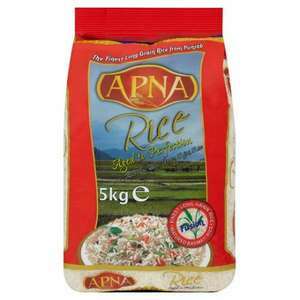 "A blend of long grain rice and basmati rice. Brings you the finest extra long grain rice from Punjab. Rice with a delightful delicate aroma and delicious flavour an ideal combination for traditional Biryani. I bought this rice some time ago because it was cheap but not doing that again as it has a bad smell and taste. They are the best types of rice you can get. Any way of getting free delivery? Vote hot for price, haven't bought or tasted this so might past due to comments. these are not matured enough, becomes over boiled and sticky. Does anyone remember Anneka Rice? Cheap, but not good in taste. Does anyone remember Anneka Rice?" Yes. Synonymous with helicopters and a camera man that always seemed to follow her bum, for sime reason! I bought this cheap rice once before. It's not awful, but it requires a LOT of washing before cooking. With Tilda basmati (Dark blue packet), I normally only wash and rinse the rice twice before soaking, but with the cheaper stuff I tend to have to wash/rinse it 7 or 8 times before the water starts becoming clearer. Tl;dr, wash the **** out of the cheap stuff before cooking. Cheap, but in the bag I bought recently there were small dead black creatures in the rice (some sort of weevil). It doesn't taste or smell like decent basmati, your better off going to an Asian groceries store, cash and carry or supermarket. Not great rice, but good value I guess. If you want wet rice go for it (rice cooker or not). these rice not worth even at this price. Deal posting newbie! This is Cheap_as_Chimps first deal post. Help out by leaving a posting tip or just to show your appreciation for their contribution.